A 15-year veteran of the Junior League of Northern Virginia and a member of AJLI’s Governance Committee from 2011 to 2013, Tamara Ashford has made a career in the tricky trade of tax law. She’s stacked up degrees from Duke, Vanderbilt, and the University of Miami School of Law, positions at prestigious law firms as well as at the Internal Revenue Service, a clerkship on the North Carolina Court of Appeals, and a stint as Acting Assistant Attorney General in the Tax Division of the U.S. Department of Justice. Her latest achievement? A presidential appointment to the United States Tax Court. How do you describe your new job to people outside the world of tax law? As a presidentially appointed judge on the U.S. Tax Court, I decide cases between taxpayers and the Internal Revenue Service. The court was created by Congress in Article I of the U.S. Constitution as a forum where taxpayers can come to dispute claims made against them by the IRS. Considered nonpartisan, my appointment is for a 15-year term and is up for reappointment in 2029. I am one of 18 judges in a 19-judge court; there is currently one vacancy. To be reappointed I will again complete the approval process. What makes this venue unique from other tax courts? When the Commissioner of Internal Revenue Service has determined a tax deficiency, a taxpayer may dispute it in the Tax Court, which is the only federal court where this can be done before any tax is paid. There can be one dollar at stake or millions of dollars at stake and the matters at issue can include income taxes, estate taxes, and liens and levies, among others. As much as 70 percent of the entire regular docket heard in a trial session consists of individuals representing themselves. All they have to do is pay a filing fee. How did you become a judge? What was your inspiration? In 1997 I arrived in D.C. to work in the Appellate Section of the Tax Division of the U.S. Department of Justice. I was a young attorney, appealing before judges, and this sparked my interest in becoming a judge myself. I thought I had the mindset and the temperament to be an independent arbiter. I love what I’m doing. When the vacancy opened up in October 2012, and I was nominated in September 2013, I was the Principal Deputy Assistant Attorney General—a position to which I was appointed by Attorney General Eric Holder— as well as the Deputy Assistant Attorney General for Appellate and Review and Acting Deputy Assistant Attorney General for Policy and Planning in the Tax Division for the Department of Justice. Around February 2013 a mentor and co-worker who headed the department joined with other colleagues to float my name over to the White House Counsel’s Office for consideration. I had a series of interviews with folks at Treasury and with the Office of Presidential Personnel at the White House, which initially vets all political appointments government-wide. I guess everyone liked what they heard. Then I remember getting a call from Presidential Personnel when walking up to the Grand Hyatt for AJLI’s Annual Conference in May of 2013. I was told I was the potential nominee but that I had to keep it quiet. I then moved into the next phase—formal vetting by the White House Counsel’s Office. With the assistance of the FBI, they talk to people you know and examine your finances, your tax returns, published writings and speeches, and your memberships and offices in all sectors. What was it like to be hired by the President? When the nomination was announced publicly by the President in September of 2013, I was unbelievably humbled and honored to fill the vacancy. Confirmed by the Senate in November of 2014, I’m the first African-American woman judge among the five women who are active. There is one male African-American judge now in his second term. 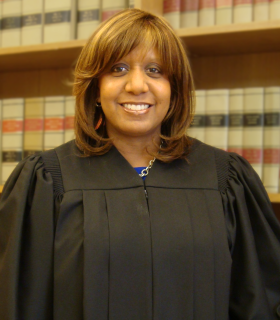 What is a typical day in the life of Judge Ashford? If I am in chambers—my office—in Washington, D.C., I am prepping for trials, issuing pre-trial motions such as orders of discovery or status reports, compelling uncooperative taxpayers to turn over documents, or issuing bench opinions. If I’m traveling—in a trial session—I am presiding over as many as 50 cases over the course of a week in one of 75 cities nationwide; the cities are selected to lessen the burden of travel upon the consumer and the year is divided into three terms: Fall, Winter and Spring. Some cases are settled prior to trial; some are continued in a subsequent session; others are dismissed. How do you take things on the road? In advance of the trial session, in a trunk like a footlocker, all of the papers and files that pertain to the cases that will be heard are shipped ahead to the courthouse where we will hold the session. My judicial robe is shipped in the trunk as well, although there have been a few times, because of timing, that I have had to carry it in a Nordstrom garment bag(!). My robe is a pretty standard one—no colored stripes down the sleeves— but starting in the Fall, I might fancy myself and don a white lace collar! How do you approach a trial? I’m particularly sensitive to the many self-represented taxpayers who appear before me/the Court. In my opening remarks at the calendar call, I like to explain the purpose of a trial and what I’d like petitioners to tell me when their case is called, as well as acknowledge the pro bono lawyers. Then at trial, I like to explain for petitioners how things will proceed, including testimony and cross-examination. Often many of the cases are settled before they get to court. What are the attributes you bring to your post? Part of the delicacy of being a judge is not to show favor to either party. Often a taxpayer’s experience in dealing with the IRS has been confusing and not pleasant. They may not perceive that their case can be adjudicated fairly and they may be scared; it may be the first time the parties are talking to one another. In pro se cases, where taxpayers represent themselves, they don’t necessarily understand the process or the system and so I have to try to help them without showing favor or opposition. Are there any perks to the job? My travel schedule this year will take me to Los Angeles, New Orleans, Atlanta, Boston, Milwaukee, Albuquerque and elsewhere. This gives me a chance to visit other AJLI Governance Committee members. How do you think The Junior League is known today? We are a cadre of trained volunteers whom folks in the community rely on when looking to get something done. We know the community, we can investigate, we can help shape the solution. I owe much of my professional success up to this point to competencies and skills I amassed in The Junior League. I have to be an independent adjudicator, I have to hear disputes expeditiously and make good decisions. How do you draw upon your experience in The Junior League in your day job? Preparedness comes to mind. I do believe I owe much of my professional success up to this point to competencies and skills I amassed in The Junior League. There are many common threads between the two. I have to be an independent adjudicator, I have to hear disputes expeditiously and make good decisions. As a committee chair and all the way through to serving as President from 2008 to 2009 of the Northern Virginia League, I learned what it takes to develop and build something from the ground up. In this case it was a children’s museum (that ultimately became a children’s science center), which required raising capital ($250,000) and engaging volunteers (2,500 hours). I learned how to network, make good decisions, conduct wise dialogue, be inclusive, and educate those who questioned a pledge made years prior about why our community needed the center. What was it like to serve on the Governance Committee? It was great to be present in the early stages of the strategic planning process during my term as an At-Large Member from 2011 to 2013. We recognized that we needed to change if we are to continue to be relevant worldwide. Our work is not done. At the international level, at the Association level, and on the Board, we must look inward at our practices or otherwise be extinct. Reposted from connected, originally published July 2015.